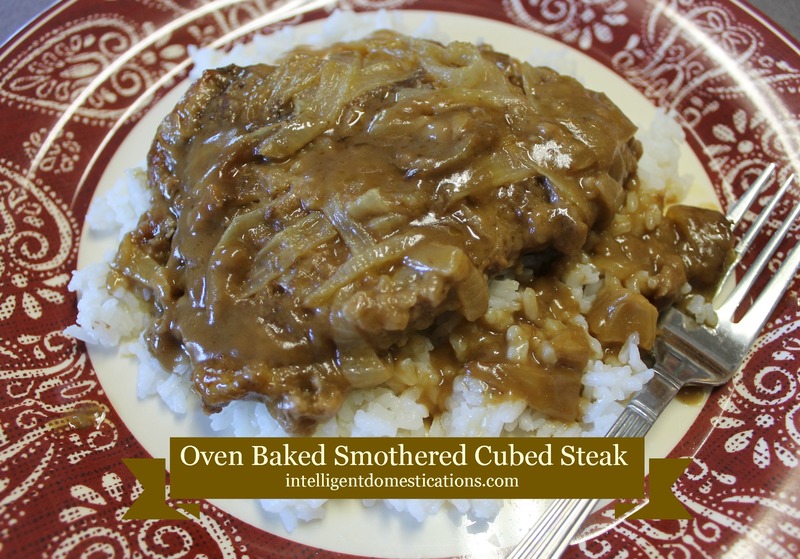 My Oven Baked Smothered Cube Steak always means a crowd around the dinner table. I make it just exactly the way Mom did. Making a meal like this requires some time investment in the kitchen. There are multiple steps to the process but the results are rewarding! 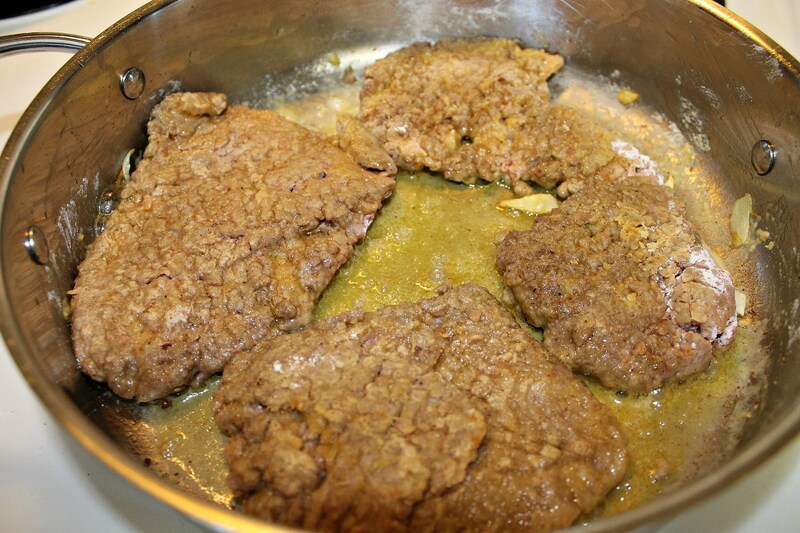 We are making the gravy from scratch which is a big part of why these Smothered Cube Steaks are so delicious. The most important thing to know when making gravy is how to prevent the lumps! Updated to include a step by step video. In the video, I made it in an Iron Skillet which goes straight into the oven. Scroll down for printable recipe. Printable recipe at the end. I begin by searing the onions. Onions are always optional. You can adjust this recipe to skip the onions if you need to. Place about 2 Tbsp. 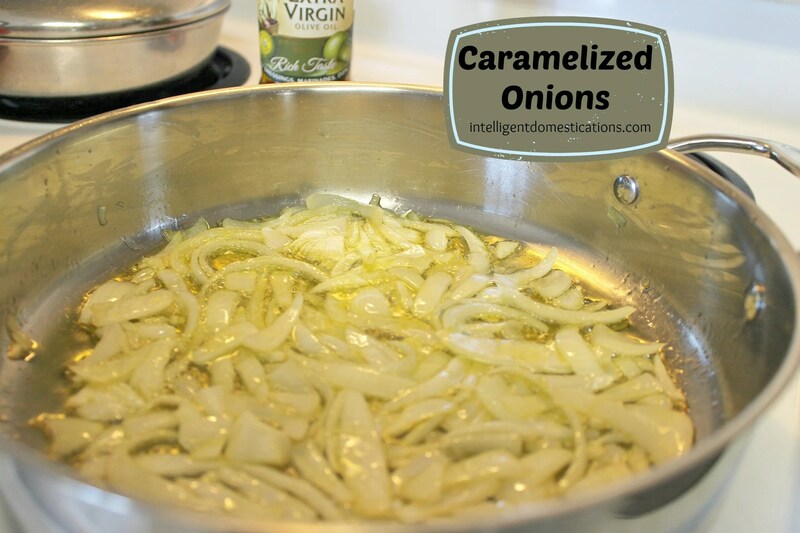 of Olive oil in the skillet and add sliced onions. Cook on medium high until onions are clear, stirring often. Take the onions up leaving the oil in the skillet. After coating the cubed steak front and back with seasoned flour, fry on both sides just until lightly browned. You are not trying to cook through. You only want brown the outside of the meat and take up. Drain on paper toweling. Leave the oil and the meat renderings in the skillet for making the gravy. Sprinkle a couple Tablespoons of sifted flour across the surface of the skillet into the oil. There shouldn’t be much gravy base at this point. Don’t worry, that little bit of gravy base will make a skillet full of gravy! Using a fork, stir and break up any lumps at this time. You will need to work quickly. Add your liquid, slowly stirring as you pour. To make the gravy brown, I use about 1 cup of black coffee which adds that special flavor to homemade brown gravy. Then add hot water until you have the desired amount of gravy. Continue stirring until the gravy comes to a boil. Allow to simmer, stirring occasionally until desired thickness is achieved. Place the cubed steak into an appropriate sized baking dish which you have sprayed with non-stick spray. Add the seared onions now before adding the gravy. Pour the gravy over the meat and onions. Cover with foil. 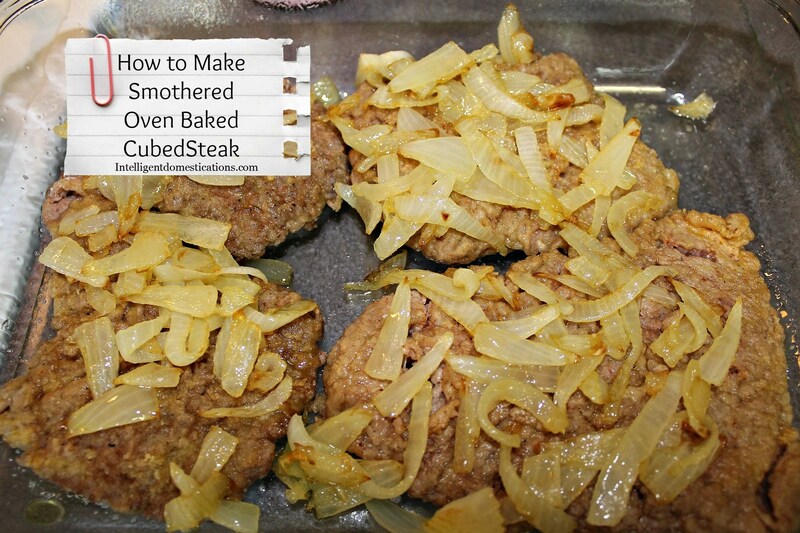 The secret to fork tender Oven Baked Smothered Cube Steak is to cook it slow on low. Print or download recipe below. Serve over a bed of rice and enjoy your husbands smile! This meal is what we call ‘fork tender’, no knife required! Cook on medium high until onions are clear. Take the onions up leaving the oil in the skillet. You will need medium high heat for this process. Do not walk away!! Leave the oil and the meat renderings in the skillet for making the gravy. Sprinkle a couple Tablespoons of sifted flour across the surface of the skillet into the hot oil. Using a fork, stir and break up any lumps at this time. You will need to work quickly. Add your liquid, slowly stirring as you pour. 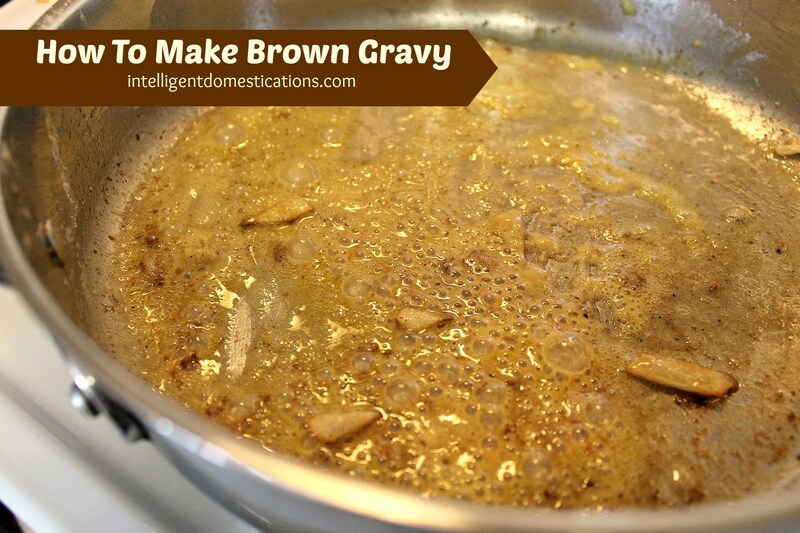 (To make the gravy brown, I use about 1 cup of decaf coffee which adds that special flavor to homemade brown gravy.) 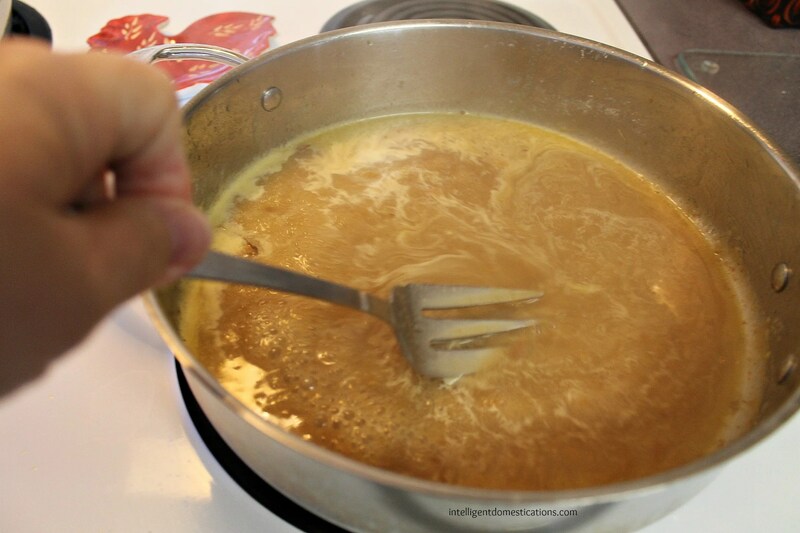 Then add HOT water until you have the desired amount of gravy, stirring constantly. Sprinkle with desired amount of salt and pepper. Continue stirring until the gravy comes to a boil. Allow to simmer, stirring occasionally until desired thickness is achieved. 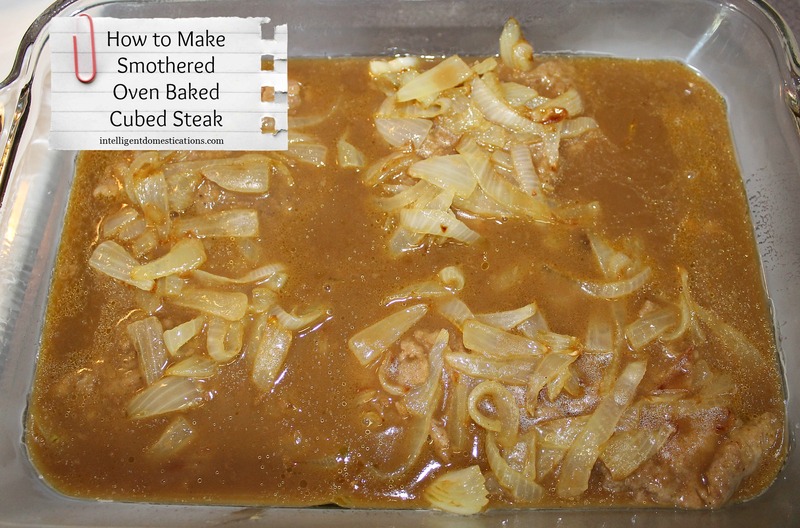 While gravy is simmering, place the browned meat into a prepared baking dish. Pour the gravy over the top of the meat. Bake at 300° for about 3 hours. Now that I’ve started expanding my culinary skills, I am REALLY enjoying cooking sauces and meals from scratch! I can see why your husband gets so excited for this dish! Ooo…this looks delicious. Can you believe that I’ve only recently started using cubed steak?! I can’t believe it took me so long to use this type of meat. It’s so yummy breaded with gravy. This looks like an interesting and easy recipe. I will try this tonight. However, I’m adding some low sodium beef broth (with 1 tsp instant coffee), and sea salt for flavoring. I’ll let you know how this comes out. Thanks for your time and effort on this website. This recipe makes me want to try cubed steak again. Yum! Thanks for sharing at #AnythingGoes. I just saw your post on google+ . So glad you shared it there. Coffee in the gravy has me intrigued! Pinning. Only one word is needed. AWESOME! Thank you Judy, it sure was good. My mother made a lot of cube steak recipes when I was younger. My guess because there was so much you could do with it and it was a cheaper cut of meat. Thanks for linking at the Yuck Stops Here! My Mother cooked cube steak a lot when I was growing up also. It sure costs more now than back then. Thanks for stopping by, Chrystal. I’ve enjoyed hosting with you ladies at #StopTheYuck. These hearty flavors just scream Fall to me… I am getting more ready for the Fall Season to arrive every day. Thanks for sharing this recipe. PINNED! I am honored to be added to your recipe collection! I want to hear about it when you make gravy! This looks great – I refuse to buy cubed steak in the stores because I never seem to know how to cook it. Thanks for an awesome recipe! You’re welcome Zan. I hope you will tell me how your family enjoys it when you make it. The first time my youngest daughter had crackling cornbread at my mom’s house (she was about 2) she said, “Grandma, your cornbread has bones in it.” Crackling cornbread can’t be beat! And, by the way, brown gravy is so much better than white gravy (in my opinion). And every good southern cook better know how to make cubed steak. Great tutorial! That is funny Alli. Children and be so funny sometimes. It is for certain that white gravy and brown gravy both have their place at the table. We tend to prefer white gravy for biscuit type meals and brown gravy for meat and potato type meals.